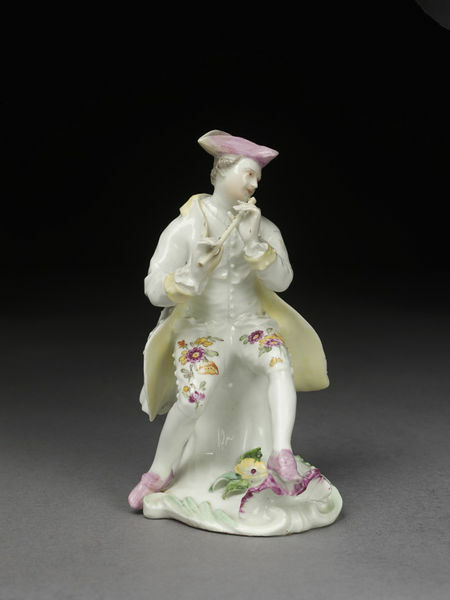 Figure of a man playing a flute in soft-paste porcelain painted with enamels. He is seated on a stump and wears a long white coat lined with pale yellow flowered breeches, pink shoes and pink three-cornered hat. Irregular base moulded in relief with foliate scrolls coloured green and pink. Figure of a man playing a flute in soft-paste porcelain painted with enamels, Derby Porcelain factory, Derby, ca. 1755-1760.